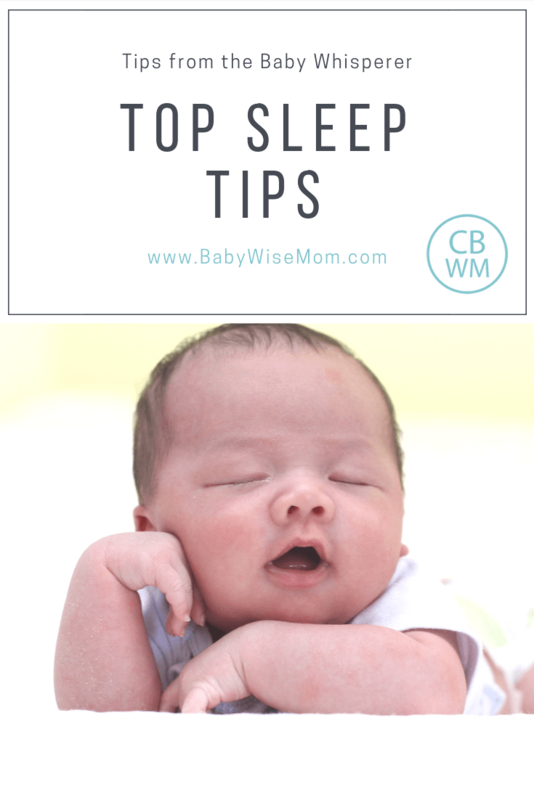 Sleep Tips from the Baby Whisperer. Get to know the different sleep types and the stages of sleep. This will help you help your baby sleep well. A little bit of knowledge can go a long way to help you get your baby sleeping well. Here are some tips from the Baby Whisperer to get great sleep. Babies pass through these stages every time they fall asleep. The entire process takes about 20 minutes. Stage 1–The Window: this is when your baby shows his nap cues. See Nap Cues. Hogg recommends having baby down by the third yawn (though best to act on the first). Stage 2–The Zone: your baby has a fixed, focused gaze. This lasts 3-4 minutes. His eyes are open but he isn’t really seeing. Stage 3–Letting Go: He closes his eyes, his head drops forward or to the side. He seems to be falling asleep then is back awake…he repeats this process 3-5 times then goes to sleep. I love this blog, I’ve learned so much already but…I am on the verge of tears the last few days…I need some help with naps. My daughter is 5 months. She takes about a 1 hr nap in the morning after her first feeding and then her naps only last 30 min about 2 other times during the day. She is sleeping great at night (about 10-11hrs).So the last few days I’ve realized part of the problem is me. I need to get her down earlier and be commited to stay home to work this out. She sleeps easily in the car, swing etc. So my big questions are how to extend her naps and how does her waketime fit into trying to get her to sleep/or back to sleep. It takes her 10-20 min to fall asleep. Then right at 30 min she wakes up. I’ve tried today to let her CIO for up to an hour in her crib when she wakes up after the 30 min. But she will not fall back asleep. So then do I count her wake time from when she wakes up after the 30 min nap? Then usually I feed her and it seems like it would be time to nap again…Because she is only napping 30 min she is still on a 3 hr feeding schedule. But with all this, I feel like everything is off. I’ve read everything posted on how to get her to sleep longer..but nothing is working. I have a dark room, sound machine, i follow a routine with her before every nap. I guess I wonder should I just plow through this week putting her down every 1.5 hrs of wake time and letting her cry in her crib up to an hour after a fake nap???? I feel like it is hard to listen to her cry so much, but I am willing to try it if she will learn to sleep longer. HELP! You do need to give it some time with consistency before seeing improvements in napping. Good luck and hang in there! hi!first time posting but I have to say I have been using your blog as a resource and its great! thank you!I have a regarding sleep and wake time.DS is 4.5 months, I just started reading BW about 3 weeks ago so I am a little late in the game but getting there!DS is great at putting himself to sleep!If I hit the sleep window just right..he is asleep within 10 minutes. And he sttn..on average 10.5 hours each night. he hardly ever wakes up crying, he just talks and talks when he wakes up from naps and in the morning.His wake times during the day are short also…usually btw an hour to hour and fifteen minutes. I have tried extended it by 10-15 minutes but then I miss his sleep window and it takes him 25-30 to fall asleep:-( I just started trying to extend them about a week ago. His naps are good…he naps 3 times a day with the first two being 1.5 hour and the last is usually 2-2.5 hours.I have two issues that are bothering me and I feel like I am missing something that is right in front of me! !1) Ds does one of two things each morning….wakes [email protected]:00 and goes back to sleep after 20 minutes til 6:15-6:30. OR he wakes up at 5:30 ready to start the day. I have tried giving him 20-25 minutes to see if he will go back to sleep but he is ready to get up, I never go in until 6:00a.m.2) He is waking from his last nap 4:00/4:15 and doesn’t go to bed until 7:00. If I added a 4th nap, it would be taking place from 5-6 and I am not crazy about him napping at that time. At 5:30 he gets very cranky because he is tired. I am wondering if he is waking so early because by the time goes to bed at 7:00, he is overtired and not resting as well as he should.So the only things I can think of are to keep trying to extend his nap times hoping that his clock will readjust, move his bedtime up to 6:30 or add a 4th nap?any insight? I am very perplexed by all of this lol Maybe I just have a baby who likes a lot of sleep :-Pthanks so much! Deanna, I think there is a good chance he could be waking early in the morning because of being overly tired, but take note that for his age, sleeping as long as he is at night is wonderful, espcially considering that he has only been doing this for 3 weeks. At four months, you don’t necessarily need a 4th nap. Most drop it at 4 months, so 3 would be normal. BUT if he needs it, you can have him do it for a bit. Also, his waketimes are not too short for his age. Forcing him to extend waketimes when he isn’t ready to will only backfire in shorter naps. Waketime: Length, Extending, and Calculating: http://babywisemom.blogspot.com/2008/02/waketime-length-extending-and.htmlOptimal Waketime Lengths : http://babywisemom.blogspot.com/2008/07/optimal-waketime-lengths.htmlIf I were you, I think I would either try the 4th nap or put him in a swing or something at that fussy time and see if that will help. You can’t expect more than 12 hours of sleep, so if you do 6:30 bedtime you will get at least a 6:30 wake time in the morning. If you are okay with that, then you can try that also. It just might cut into your evenings if you want to go out at all. Hi! I don’t know if you saw my last blog on my daughters naps, but we are having success on her morning nap. She has still been sleeping 11 hrs at night, BUT ever since shes been doing better on her naps, shes making a lot more noises during the night! She used to be completely quiet the whole night so I knew she was sleeping well.I can’t tell if shes waking up (her eyes are still closed), or just not sleeping as soundly bc shes getting more sleep during the day. She usually does it around 4 am, and sometimes two hrs after shes gone to bed (goes to bed at 7). Is this normal? Shes already dropped her fourth nap. There’s no way she’ll take more, and shes not cranky at nighttime so I knwo she doesnt need more. Is she getting too much sleep during the day? When she naps they are two, 2 hr naps, and then one 45 min (she took a long afternoon nap yest too! ), or one 2 hr nap and 3, 45 min naps. Ive thought about reducing them to hour and a half naps but that means shed just take a longer third nap anyway bc of the schedule change, which would make up for the lack of the two hour naps earlier. So the total sleep hrs would still be the same. I just want to make sure shes getting quality sleep at nighttime. Any thoughts?! Thanks!! Hello again!My son is almost 9 weeks, and I just started back at work last week. I am a very lucky mother because he is allowed to come with me. 🙂 I work Tues-Thurs, 8:30-1:00. His first feeding is at 7:30 each morning. I feed him, then put him in his car seat to fall asleep, since we leave for work pretty soon after. When I get to work, he still has 2 hours until he has to eat…and I have found that if I take him out of his car seat and put him in his bed when we get there, he sometimes doesn’t sleep very well. But 2 hours in a car seat does not seem like it would be very good for him. He also gets really hot sometimes.This situation also presents itself at other times throughout the week, for example, when we get home from church on Wed’s and Sun’s. Is it ok for me to leave him in his car seat to sleep so many times in one week or do I need to figure out a way to move him to his bed to finish his naps?Thanks! Do what you feel comfortable with. I always leave my kids in the carseat if we get home and they are asleep. They never move well. If he is in the room with you and everything, you can keep an eye on him and know he is okay.